Manufacturers in the global DNA and RNA sample preparation market are focusing on developing and promoting comprehensive solutions to retain market share. For instance, key players in the global DNA and RNA sample preparation market are focusing on the development of new and innovative sample preparation instruments. The suppliers in this market are concentrating on meeting the needs of CROs, academic and research institutes, diagnostic centers and forensic science laboratories. In a new report titled “DNA and RNA Sample Preparation Market: Global Industry Analysis and Forecast, 2017–2025” the analysts of Persistence Market Research have observed that manufacturers are concentrating on balanced segmental growth and multiple successful commercial products. They have further noticed that the companies are aiming at creating a balanced and focused product portfolio. The corporate strength of the company lies in its undependability on only one product but on creating multiple product segments with significant revenue share. According to the expert team of analysts, the key companies in the global DNA and RNA sample preparation market are entering into mergers and acquisitions to develop and promote comprehensive solutions and expand their market presence globally. A targeting of the various geographies reveals that North America represents the most lucrative market followed by Europe and Asia Pacific. Multinational companies are focusing on expanding their business in these regions owing to the huge growth potential. The global DNA and RNA sample preparation market report begins with the definition of the market and relevance and impact of forecast factors used to estimate the global DNA and RNA sample preparation market growth. It is followed by an overview of market dynamics of the global DNA and RNA sample preparation market, which includes Persistence Market Research’s analysis of key trends, drivers, restraints and opportunities that are influencing the development of the DNA and RNA sample preparation market. Impact analysis of key growth drivers and restraints based on the weighted average model has been included at a regional level in the global market report after detailed analysis of individual regions to better equip readers with meaningful insights on ongoing developments in the global DNA and RNA sample preparation market. In the final section of the report on the global DNA and RNA sample preparation market, detailed profiles of life sciences laboratories are included to evaluate their long- and short-term strategies, key offerings, SWOT analysis, and recent developments in the global DNA and RNA sample preparation market. The forecast presented in this report assesses the total revenue of the global DNA and RNA sample preparation market. When developing the market forecast, the starting point involves sizing the current market, which forms the basis for the forecast of how the market is anticipated to take shape in the near future. Given the characteristics of the market, the analysts have triangulated the outcome on the basis of analysis based on supply and demand sides. The report also takes into consideration year-on-year growth to understand the predictability of the market and to identify the right opportunities across the global DNA and RNA sample preparation market. As previously highlighted, the global market for DNA and RNA sample preparation is split into various categories. All these segments have been analyzed in terms of basis point share to understand segmental contribution to overall market growth. This detailed level of information is important to identify various key trends in the global DNA and RNA sample preparation market. Macro-economic indicators such as healthcare industry outlook, healthcare spending, Gross Domestic Product, and others have been considered to arrive at the indicated market numbers. Bottom-up approach has been used to assess market numbers for each product category while the top-down approach has been used to counter-validate the estimated market numbers. Yearly change in inflation rate has not been factored in while forecasting market numbers. Historical consumption trend has been analyzed to track data. 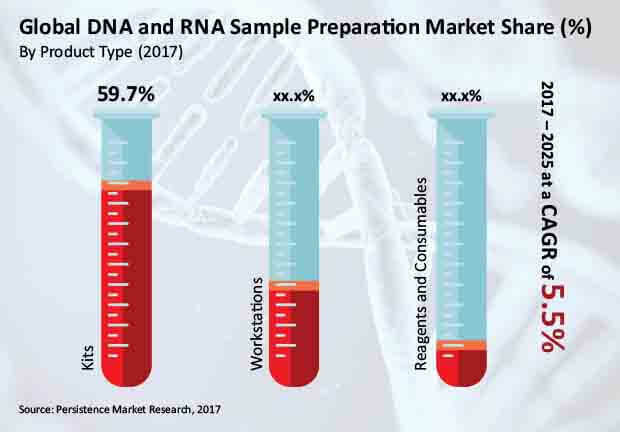 Among the different product type segments of the global DNA and RNA sample preparation market, the Kits segment dominated the global DNA and RNA sample preparation market in revenue terms in 2016 and is projected to continue to do so throughout the forecast period. The Kits segment – which consists of two sub-segments namely DNA sample preparation kits and RNA sample preparation kits – is estimated to be valued at more than US$ 800 Mn (close to 60% share of the total market) in 2017 in terms of revenue, expanding at a CAGR of 5.5% over the forecast period. The segment is expected to represent absolute $ opportunity of more than US$ 40 Mn in 2018 over 2017, also creating an incremental $ opportunity close to US$ 440 Mn between 2017 and 2025. Revenue from the Kits product type segment is expected to increase 1.5X between 2017 and 2025. The advantages of kits over other sample preparation products include minimal DNA loss, recovery of high molecular weight DNA, improved reliability and reproducibility. Increasingly complex requirements from researchers in the life sciences domain have led to a development of novel products that are expensive. Due to uncertainties in the results expected from complex experiments, several users do not prefer to invest in such expensive products, especially for research groups with limited budgets and funding. Furthermore, custom research products and services are usually several-fold more expensive than products listed on the catalogs of most major suppliers of research products. These factors are creating a negative impact on the growth of the Kits segment. The major challenge whenever isolating, manipulating, or analyzing RNA is the presence of RNases. These are extremely stable and very active nucleases capable of degrading RNA. For example, bovine pancreatic ribonuclease A is one of the hardiest enzymes in common usage; one isolation method boils a cellular extract until all proteins other than RNase A are denatured. Therefore, an RNase-free work area is essential when isolating RNA. Besides, challenges of nucleic acid sample preparation working with RNA provides very different challenges from working with DNA. Owing to this, the growth of the RNA sub-segment of the Kits product type segment is likely to be hampered during the forecast period. Process related challenges is another factor that is expected to restrain the growth of the Kits segment. Contamination of the DNA-RNA samples after the sample preparation may interfere with the analysis. Besides, the extremely small sample size that is obtained after the sample preparation is found to be very difficult to analyze. Scarce RNA transcripts and viral nucleic acids in biological fluids are difficult to detect. Degradation of samples starts as soon as the sample is collected, particularly RNA samples. All these factors act as impediments in the revenue growth of the Kits segment.. The Kits product type segment dominated the North America DNA and RNA sample preparation market in revenue terms in 2016 and is projected to continue to do so throughout the forecast period. The Kits segment is the most attractive segment, recording an attractiveness index of 5.0 over the forecast period in the North America DNA and RNA sample preparation market. The Latin America region is developing its healthcare infrastructure and ongoing studies in clinical testing and diagnostic testing are likely to contribute largely to the growth of the Kits product type segment of the DNA and RNA sample preparation market in Latin America.